Someone still wants the K-Cup. Keurig Green Mountain, the company best known for its K-Cup coffee, is being bought and taken private for about $13.9 billion. The main acquirer is JAB Holding Company, the investment arm of the billionaire family that in 2014 combined its coffee business with that of Mondelez to create a company with annual revenue topping $7 billion. JAB’s portfolio also includes Peet’s Coffee & Tea, a chain that has recently acquired two smaller coffee brands, Stumptown Coffee Roasters and Intelligentsia. The acquisition price of $92 a share represents a whopping 78% premium over where Keurig’s shares closed on Friday. 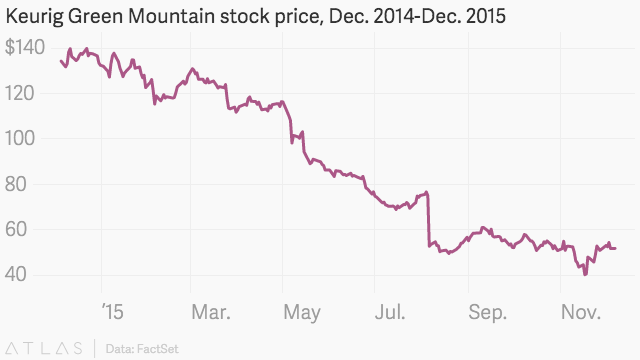 Keurig’s stock jumped around 75% to $90 and change at the bell on Monday (Dec. 7). Before today, Keurig’s stock had tumbled 61% since last December on challenges that include soaring coffee costs, a failed new coffee machine, and a big, embarrassing recall of an existing K-Cup brewer that was spraying users with hot water. 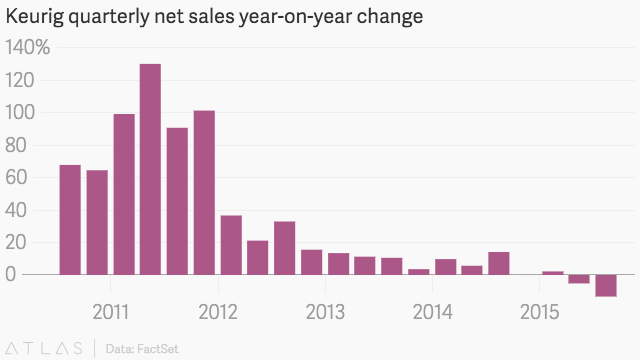 The company’s sales growth, which was small but steady for most of 2013 and 2014, turned negative this year. In the most recent quarter, Keurig said sales of both coffee pods and coffee makers fell sharply. After settling on such a big premium, it seems like JAB is probably assuming that too.